For roughly eleven hundred years now,Â Justice Society of America has been foreshadowing something wicked that may this way come.Â This issue, finally, we get past the preliminary “Ooooh, scary stuff, kids” and delve into the meat of the tale…Â But, is it Prime Rib, or that weird rubbery blue stuff you get out of airport sammich machines?Â And speaking of meat and meat by-products, why is Black Adam roasting that cadaver?Â Answers after the clicky! Previously, on Justice Society Of America:Â A serial killer takes out those who would pretend to godhood, including Goth, a Marilyn Manson wannabe, who nearly explodes.Â Thom Kallor, the former Star Boy of the Legion, now a schizophrenic JSA Starman, manages to keep him from destroying the eastern seaboard, but accidentally creates a collapsar that links to Earth-22, home of the reality known to us as “Kingdom Come” (and known to Alex Ross as “My Meal Ticket.”)Â This wormhole spits out a variation on young Kal-El, an older and more weathered version of the Superman we know.Â His presence has discomfited the Justice Society, the people of the world, his younger Earth-1 counterpart, and has led to the realization that one of his villains (or a reasonable facsimile thereof) is active on this earth.Â Of course, the battle with Magog goes less than swell, but even the JSA is surprised when Magog is literally consumed by the stone face he worships, which then reveals it’s entire giant stone body and climbs up, declaring itself to be… Gog! Mister Terrific tries to communicate with Gog, but the titan doesn’t respond, instead beatifically smiling as birds frolic on his shoulder.Â It’s a really disconcerting moment, made more so by Mr. T’s anger that Gog won’t respond.Â Amazing Man steps forward, and theorizes, “if he is a god, I would guess he’d hear your voice as easily as a machine would.Â Which, given your ability to evade detetion by any means electronic, means not at all.”Â A-Man asks who he is, and Gog answers, then stomps away.Â He follows his instincts to a nearby village, riddled with plague and disease, and he comes booming out of nowhere.Â “I come in peace” bellows the behemoth, and heals the entire village with a barrage of Kirby dots.Â The JSAers are stunned to see the crying children healed and whole, and Lance asks, “What did he do?”Â “I made them good again,” replies the lost God. Meanwhile, somewhere in Kahndaq, two desperate grave robbers invade the tomb of Isis, looking to make a little scratch off the gems in the “cursed” mausoleum.Â What they find is Teth-Adam, laying in the stone sarcophagus, with a look of outrage on his face, and one word on his lips.Â “SHAZAM.”Â The would-be robber is incinerated, and the newly reempowered Black Adam stalks toward his pleading partner, snapping his neck with an idle twitch of his fingers.Â Adam turns, thinking about how he had hoped that Mary Marvel might have altered his powers, giving the magic the ability to help him resurrect Isis.Â But just as he gives up all hop, he sees a white rose, growing from between the stones, and realizes that his long lost wife may not be as lost as he had feared. 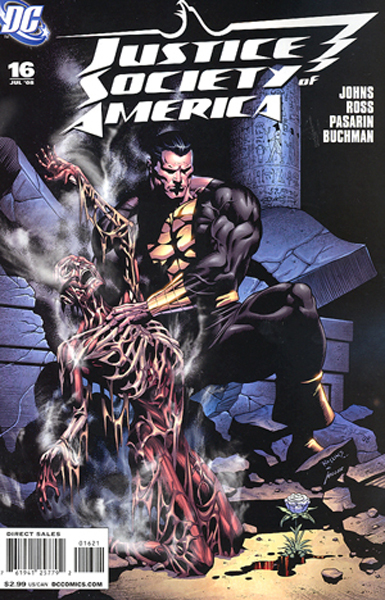 I know no one here can really answer this, but why is Black Adam and Isis on this cover!? I appreciate the re-direct Matthew, wouldn’t want to be “russell-ed” by you displaying the actual cover. It was nice to finally see something happening. I’ve still been enjoying JSA, but they could’ve condensed the last arc by an issue or two. I’m sure everyone noticed, but I figured I’d point out that the symbol on Gog’s hand during the depiction of his “fall” is the same as the symbol that is now on Lance’s arm, so I’m betting they’re somehow related. Also, I’m wondering if the fact that Gog can’t hear Mr. T is some indication that Gog is somehow technological in nature…you know, a robot. Meaning that Al Pratt’s having super powers translated into Damage receiving super powers, but not inheriting the same specific super powers. At least, that’s what I got out of that caption box. wait, is it wrong that a.) I got that b.) found it humorous and c.) am the only one who commented on it? I thought Vandal Savage genetically engineered Damage’s powers. @Roy – damn, I must be losing my edge, I hadn’t caught that. But I find it funny, too, so even if you are wrong you’re not alone. Does anyone have a list of exactly whose DNA got put in the blender for Grant? The thing that always bothered me was that we’ve never seen him use any of these DNA donors powers at all. Glad to see Grant get some screen time. I enjoyed his solo from the 90s and was so sad at the treatment he got from Infinite Crisis (and that nobody else cared). Glad Johns had a plan all along, though, and I hope that this issue and the Jessie/Damage-centric issue bode well for him and he continues to shine. 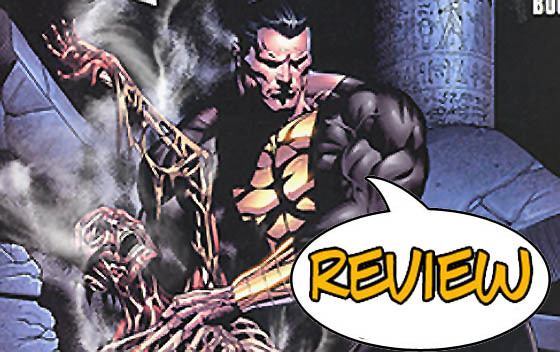 Also, can’t wait for Black Adam and Isis, and hope Atom Smasher’s back for it too! There’s no guarantee that such a DNA mix would result in him getting any specific powers. It’s like when you mix foods together and the resulting dish tastes nothing like any of the individual ingredients. I’ve always seen his DNA mix as having essentially overpowering him. He can’t control the energy and so the results are explosive. He may one day be able to control and apply the energy in other areas. Wasn’t there a mystery guy in his series who seemed like he might be his future self, who was in control of the powers? Just a note, but Eaglesham isn’t on this issue. The penciller is Fernando Pasarain. I liked him although I felt like he skimps on the details on the characters in the background. What’s with red suit Flash wearing the silver helmet in the Gog backstory? Is that just supposed to tell us that William Matthews was seeing stuff that has no relation or consequence to the main DCU?